Alt Thai News Network ATNN : Thailand: Regime is not "Democratically Elected"
Thailand: Regime is not "Democratically Elected"
Thaksin Shinawatra runs Thailand - He was not elected, was not on the ballot, was not EVEN IN THE COUNTRY - Laying the "democratically elected" myth to rest. December 3, 2013 (Tony Cartalucci) - Earlier this year, the New York Times wrote in its article, "In Thailand, Power Comes With Help From Skype:"
The country’s most famous fugitive, Thaksin Shinawatra, circles the globe in his private jet, chatting with ministers over his dozen cellphones, texting over various social media platforms and reading government documents e-mailed to him from civil servants, party officials say..
What sounds like the making of the next banana republic, is instead a fact now being conveniently buried, as anti-regime protesters struggle to purge the proxies of Thaksin Shinawatra, with his foreign backers throughout the Western media claiming that his proxy government, headed by his own nepotist-appointed sister, Yingluck Shinawatra, is both the legitimate government of Thailand and "democratically elected." This is perhaps the most pervasive myth surrounding the current conflict in Thailand and is perpetuated by Western media sources and the regime itself. Elections did indeed take place, and in those elections, the current regime did garner the most votes, but the same could be said about elections held anywhere, even in nations that are decidedly very undemocratic. Despots throughout history have used elections as a veil of legitimacy behind which they hide - and hiding a despotic, hereditary regime is exactly what the Shinawatras are doing in Thailand. 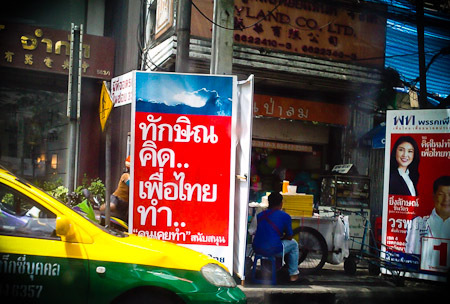 The campaign slogan in 2011's general election literally was, "Thaksin thinks, Puea Thai (his political party) does," indicating that his sister Yingluck, like her two predecessors, Somchai Wongsawat (Thaksin's brother-in-law), and Samak Sundaravej (who literally declared he was Thaksin's proxy to TIME), is merely filling a superficial role. West's Defense of "Democratically Elected Government" is really the Defense of their Investment in Shinawatra. So why is the West defending what is clearly a dysfunctional democracy, clearly abusing the mechanisms of real representative governance, to perpetuate a very undemocratic regime? To understand the answer to that question, one must examine the immense investment the West has made in the Shinawatras over the last decade. 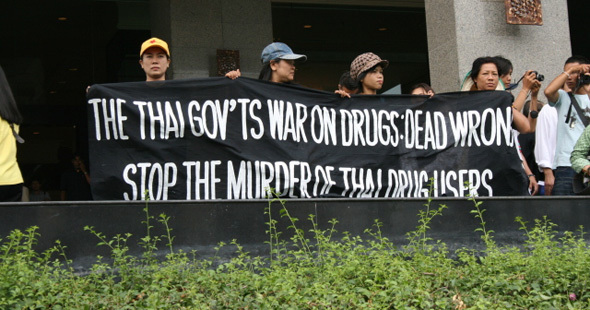 The following year would see the Tak Bai incident which saw 85 protesters killed in a single day in Thailand's deep south. And despite Thaksin's atrocious human rights record, by far the worst in Thai history, and even challenging regional lows, the West continued to support his regime. 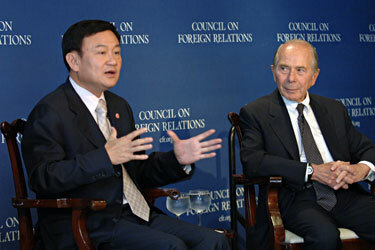 Also in 2004, Thaksin attempted to ramrod through a US-Thailand Free-Trade Agreement (FTA) without parliamentary approval, backed by the US-ASEAN Business Council who just before last year's 2011elections that saw Thaksin's sister Yingluck Shinawatra brought into power, hosted the leaders of Thaksin’s "red shirt" "United Front for Democracy against Dictatorship" (UDD). Since the 2006 coup that toppled his regime, Thaksin has been represented by US corporate-financier elites via their lobbying firms including, Kenneth Adelman of the Edelman PR firm (Freedom House, International Crisis Group,PNAC), James Baker of Baker Botts (CFR), Robert Blackwill of Barbour Griffith & Rogers (CFR), Kobre & Kim, and currently Robert Amsterdam of Amsterdam & Peroff (Chatham House).Robert Amsterdam of Amsterdam & Peroff, would also simultaneously represent Thaksin's "red shirt" UDD movement, and was present for the inaugural meeting of the so-called "academic" Nitirat group, attended mostly by pro-Thaksin red shirts (who literally wore their red shirts to the meeting). Additional support for Thaksin and his UDD street-front is provided by the US State Department via National Endowment for Democracy-funded "NGO" Prachatai. It is clear that the regime of Thaksin Shinawatra, is in fact, really the regime of immense foreign interests that have built him up and have kept him relevant for years. The myth of Thaksin Shinawatra's proxy government in Thailand being "democratically elected" is simply another buttress built by the West to keep his regime from crumbling under the weight of the true dimensions of his corruption, crimes, and illegitimacy.